The Neepawa Natives annual general meeting was held on Wednesday, Aug. 8 at the Neepawa Public Library. The 30th season of the Neepawa Natives in the Manitoba Junior Hockey League (MJHL) could be one of the most important in the franchise’s history, or it could be one of the last. Whichever one it turns out to be will be entirely up to the community. Lara Denbow in the process of making her gold medal winning high jump at the Legion Track and Field National Championship. (Inset) Denbow stands upon the podium with the silver and bronze medal winners. It was a tremendous weekend for Lara Denbow, of the Prairie Storm Athletics Club, at the 2018 Legion Track and Field National Championships in Brandon. 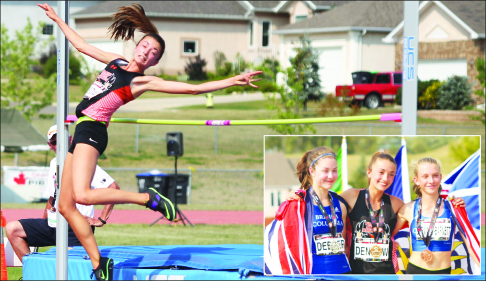 The 14-year-old from Neepawa scored a gold medal in the U-16 Girls’ high jump competition, with a jump of 1.70 metres. It was a victory that was a full year in the making for the Morden Mohawks. On Sunday, Aug. 12, the Border Baseball League representative defeated the Hamiota Red Sox 2-1 in the final of the Provincial Senior “AA” Baseball Championship in Neepawa. Quintin Lisoway has agreed to his first pro contract, signing with the Rapid City Rush of the ECHL. The preseason for the Manitoba Junior Hockey League (MJHL) has been released. The action will kick off on Monday, Sept. 3 and will wrap up on Sept. 18. MJHL commissioner Kim Davis said via media release that the preseason is an exciting time for players trying to make an impression on their respective coaches.